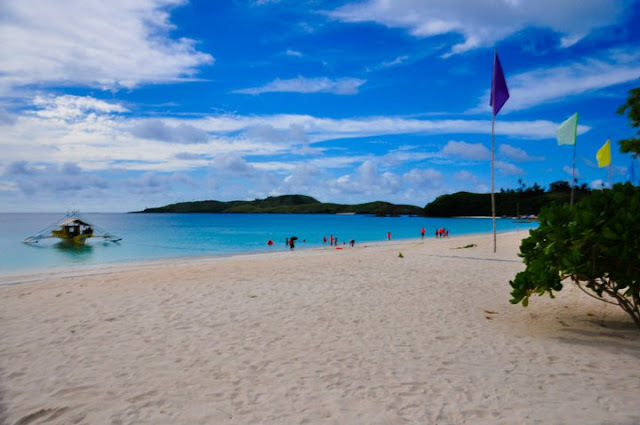 Pristine, unspoiled and picturesque, Calaguas Group of Islands. A hidden paradise in Camarines Norte. 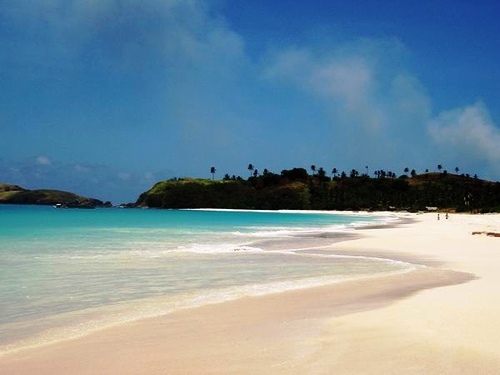 Calaguas Group of Islands is located in the town of Vinzons, Province of Camarines Norte. The island can be reached by virtue of a two (2)-hour boat ride from the mainland. It boasts of powdery white sand beaches, crystal-clear waters, and unspoiled natural resources, a place where you can truly relax while enjoying the beauty and serenity of the place. The long stretch of beach named Halabang Baybay/ Mahabang Buhangin (long stretch of sand) is found in a cove located in Tinaga Island. It is a picture perfect paradise with its long stretch of fine white sand dotted with volcanic rocks on both ends. The place is the most frequented camping and swimming site by tourists from all over the world. The jump-off point going to Calaguas Islands is Daet, Camarines Norte if you will be going via Vinzons. From Daet, you can catch a jeepney going to Vinzons and get off at the Pandawan Fish Port. 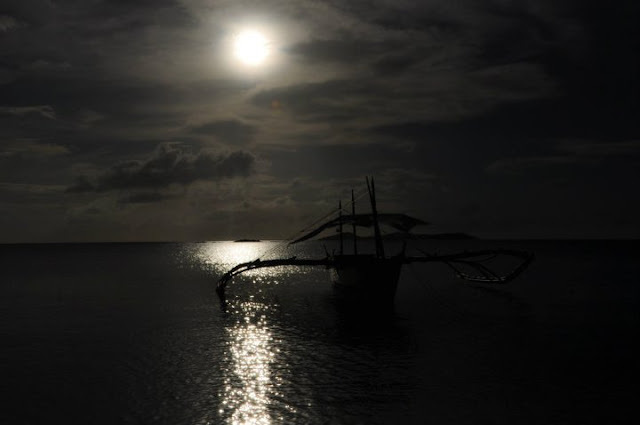 A boat going to Barangay Banocboc departs from the fish port at 11 A.M. daily. From Banocboc, you can hire a banca (small motorized boat) to take you to Calaguas Islands for as low as P500.00 or even lower depending on your haggling skills. Please take note that the return trip to Vinzons fishport leaves Banocboc at 6 A.M. the following day. 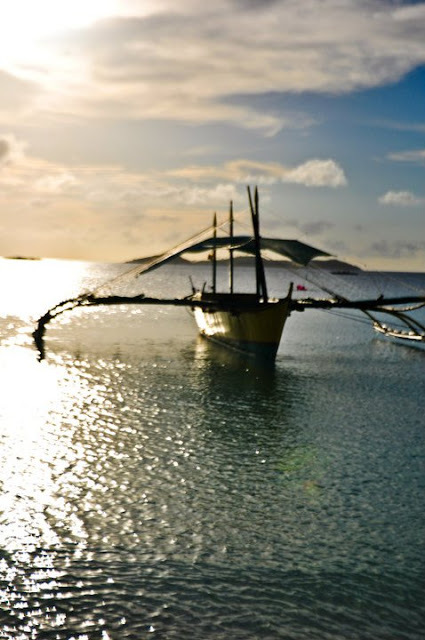 Another option is for you to hire a banca from Vinzons fish port to Calaguas Islands. Price depends on the capacity of the boat. You could hire a small boat that can fit four (4) to five (5) people for about P2,500-P3,000.00. Please note that it is a two (2)-hour boat ride from the port. So please prepare your Bonamine (medication for motion sickness) and plastic bags just in case you happened to be a byahilo (mahihilohin sa byahe or one who has motion sickness). 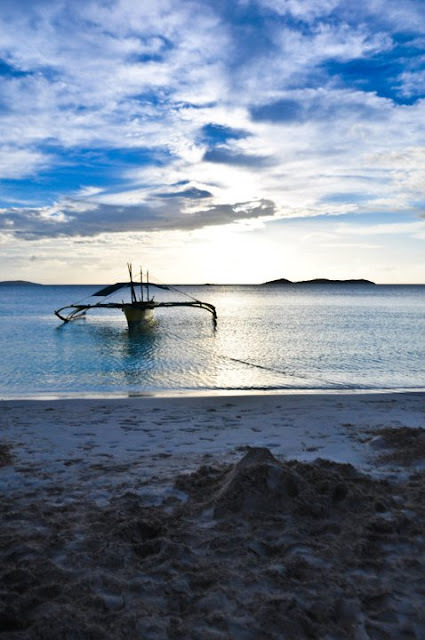 Enjoy CALAGUAS ISLANDS magnificent view of sunset, explore OUR BEAUTIFUL CALAGUAS ISLANDS beauty… you’ll definitely find a reason to smile and be happy. 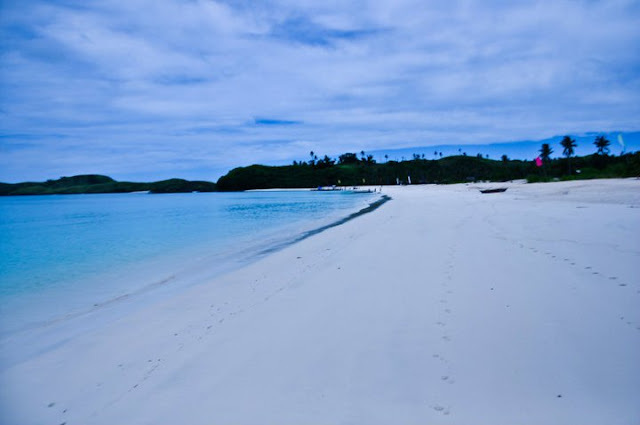 Paracale, Camarines Norte, a town popular for its gold mines (which also happened to be my Mama's birth place), is another entry point going to Calaguas Islands. Daet, Camarines Norte can be reached in less than two(2) hours by public vans. Fare is around P100.00. But if you are coming from Manila, Superlines buses have direct trips from Manila to Paracale/Panganiban, Camarines Norte. Get off at Paracale and then make your way to the fish port. Or you can ride a bus to Daet, Camarines Norte, then get off at Barangay Talobatib in the town of Labo and ride another bus for less than an hour to get to Paracale town and then proceed to Paracale fish port by riding a tricycle. At the fish port, ask around for the fishermen’s boats going to Halabang Baybay (which is a Bicol word for Mahabang Buhangin or a long stretch of sand). The boat rate going to Calaguas is as low as P2,000, which is good for five (5) to six (6) persons already. Or you could opt to ride the boat that goes to Barangay Mangkawayan, Calaguas for a cheaper fare of P50 per person. However, please note that the schedule to Barangay Mangkawayan, Calaguas is unpredictable as there are no regular public boat with scheduled departure but more of fisherman’s boat going to Barangay Mangkawayan, Calaguas. Going to Paracale from Manila, there is Superlines and Philtranco buses which have direct trips to Paracale. Alternatively, you can ride Daet-bound buses and get off at Talobatib junction where buses going to Paracale pass by. Last trip from Daet to Paracale is 6PM and 4PM for Paracale to Daet. Philtranco, Amihan (Contact No: 387-1792) and Superlines buses offer Cubao/Pasay to Daet for a travel time of approximately 7-8 hours . Fare cost differs. It ranges from P450.00 to P750.00. Tip: The buses give special discount to passengers during off season. The place mainland is called Mahabang Buhangin (long stretch of sand), a one-kilometer stretch of powdery-white sand coupled with cool and crystal clear water. The visitors are allowed to stay overnight with their own tents and camp whilst gazing at the wonderful sky above and feasting on delectable seafood. It is best to visit the place from February through September. Since it has no resorts or facilities, the island promises a wholesome and memorable nature trip. It is not surprising if you will come back for some more fun in the island. 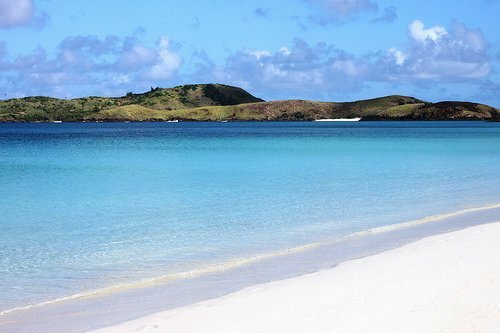 Discover Calaguas Group of Islands, swim on its turquoise water and sit on its fine white sand. 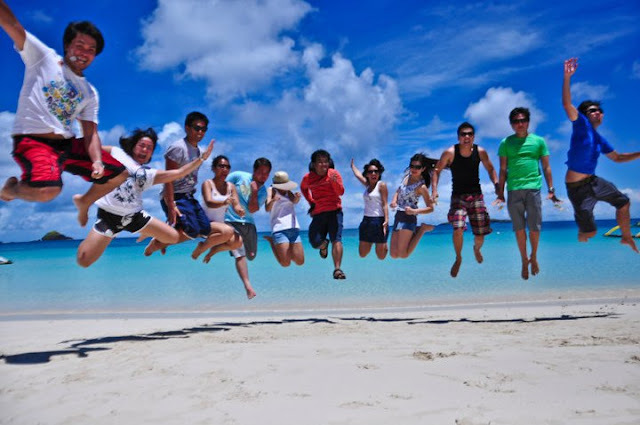 For sure, once you got the taste of Calaguas, you will certainly would want to keep coming back. Photos by my architect friend Khae Anne Naguit. Super galing ng shots niya talaga! See you in Calaguas Islands! God bless us all!